KAAN Architecten completed two buildings for the campuses of Universidade Anhembi Morumbi in São José dos Campos and Piracicaba, in the region of São Paulo, Brazil. The new interventions aim to create an architectural identity for the institution. The buildings are the home of the faculties of medicine and they share the same program as they contain classrooms, laboratories, offices, library, cafeteria and physiotherapy facilities. The pavilion-like structures appear as new landmarks: the São José dos Campos building stands isolated on an elevated plot while the Piracicaba occupies a sloping plot along a secondary urban expansion axis. The slight difference in the features of the volumes are determined by the topography, as the first one results in a more compact building, while the second is horizontally developed. At a first glance, the two buildings seem to be the result of the same constructive choices applied to a regular structural grid. 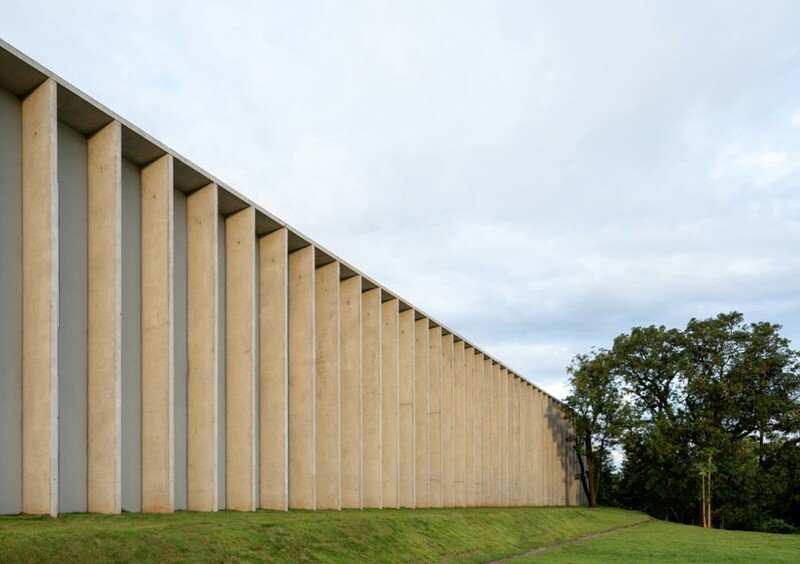 A closer look reveals that while for the elements of the São José dos Campos building were moulded in-situ, the Piracicaba building explores the possibilities of pre-cast concrete structure. The interiors of the pavilion-like buildings are divided by a passing central corridor, which constitute the social cores of the buildings. In these spaces, a ceiling pergola optimises natural ventilation and light. A similar system develops in the facades with a repetition of vertical concrete slabs and floor-to-ceiling glass; a dense grid of brise-soleil defines the east and west elevations while wide porches face south and north. All these elements contribute to manage the energetic sustainability and thermal control of the buildings in the specific conditions of the Brazilian climate.